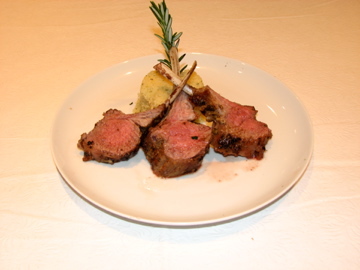 When you eat at almost any fine dining or meat restaurant you will see Rack of Lamb on the menu. You will also find at least a $30 price tag next to it as well. In fact, at Wolfgang Puck’s restaurant in The Borgata Hotel (Atlantic City) the rack of lamb is $52. Many restaurants take advantage of the fact that people are terrified to cook rack of lamb at home. Lose your fears, I had the best rack of lamb of my life and it only cost me about $20 for two pounds of lamb (about 16 chops). My mom purchased the rack of lamb at Giant Supermarket. The lamb originated from New Zealand and was vacuum packed. The layer of fat on top of the rack of lamb was still intact, which is ideal for cooking. Additionally, the lamb was also already “Frenched”; meaning the scrap meat located in between each bone was removed. After rinsing the lamb and drying it with water and paper towel, I seasoned the lamb on both sides with course salt and black pepper. I then heated a pan until it was scorching hot and added olive oil and the lamb (fat side down). I seared the lamb on each side for 3-5 minutes. Once the lamb had a nice coloring on both sides, I removed it from the pan and place it on a broiling tray. Right before placing the lamb under a 500-degree broiler I used a brush to apply a paste I had created out of Dijon mustard, red wine, garlic, honey, olive oil, rosemary and parsley. I broiled the lamb for about 8 minutes total and then allowed the lamb to rest for another 5 minutes. The lamb was extremely fragrant, giving off notes of the rosemary and garlic. Once the lamb rested I used a serrated bread knife to cut the lamb into “chops”. While I wish I had created some kind of sauce to drizzle over the lamb, it really didn’t need it. The lamb came out a perfect medium-rare and was the most tender meat I have ever had. I said to my mom numerous times while we were eating, that my jaw had to work harder to chew the couscous then it did the lamb. The mustard, garlic, and rosemary really helped accentuate the mild flavor of the lamb. We also noted that the rack of lamb tasted less “gamey” then a leg of lamb, which was nice. My first attempt at cooking rack of lamb was quite a success. Like many, cooking such a cut of meat daunted me; however, now I look forward to cooking it again and improving my recipe. I hope to do a follow-up to this recipe soon, where I cut the rack of lamb into chops and then grill them. Thanks for reading and I hope I have instilled confidence in some to cook rack of lamb. An incredible cut of lamb that doesn’t only have be to enjoyed in a restaurant.